When the German Nazis commissioned the Volkswagen Beetle in 1934, they designed it to be utilitarian vehicle for the people. It was not designed to appeal to hippies, polo-necked liberals, surfers and - as Herbie the Love Bug - American children. Most of all, they cannot have dreamt it would end its days as a four-wheeled mascot of the Third World - still trundling out of factories in Africa and Latin America long after it ceased production in Germany in 1978. The Beetle is the most popular car in history. A vehicle intended to show off the Third Reich's strength and awe the world, instead became the first global vehicle, with more than 21.5 million built in 20 countries. It is a deeply subversive success story, and its Nazi progenitors would be appalled. The beetle collected a variety of nicknames around the world -- ''el huevito'' (the little egg) in Cuba, ''coccinelle'' (ladybird) in France and "vocho" in Mexico. The first Volkswagen Beetles arrived in Mexico in 1956 - shipped over by a trio of banana magnates who were frustrated by bringing their ships back empty from Europe. 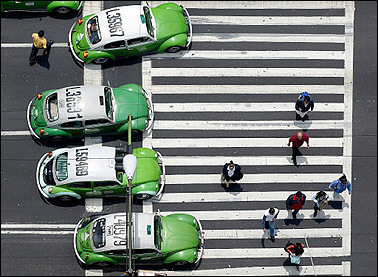 Mexico's love affair with the Beetle was almost instant. The car was cheerful, cheap, strong, and could be repaired with a screwdriver and hammer. By 1973, one in three cars sold in Mexico was a vocho. 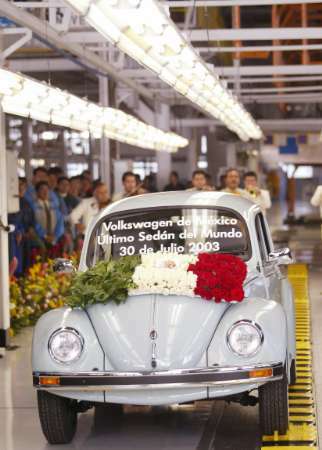 On July 30th, 2003, the 21,529,464th and final Beetle rolled off the assembly line in the Volkswagen plant in Puebla, Mexico. For some time, it was already not being sold in many parts of the world. Production in the United States was halted in 1977 after the car's design and air-cooled engine no longer met U.S. safety and emission standards. 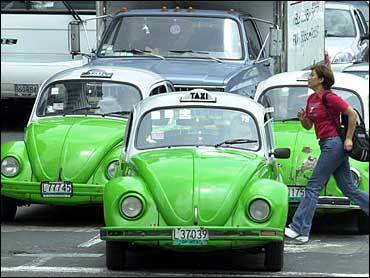 In Mexico, the final blow came when Mexico City passed an ordinance requiring that all taxis have four doors, citing safety concerns. The green-and-white taxis, usually with their front passenger seat ripped out, were a symbol of the city. They were also popular with kidnappers. Trapped behind the driver and with the assailant blocking the passenger door, victims couldn't escape (see Taxi Driver story). We will now cite some survey data from the 2002 TGI Mexico study. Within this study, there were 4,734 car owners. 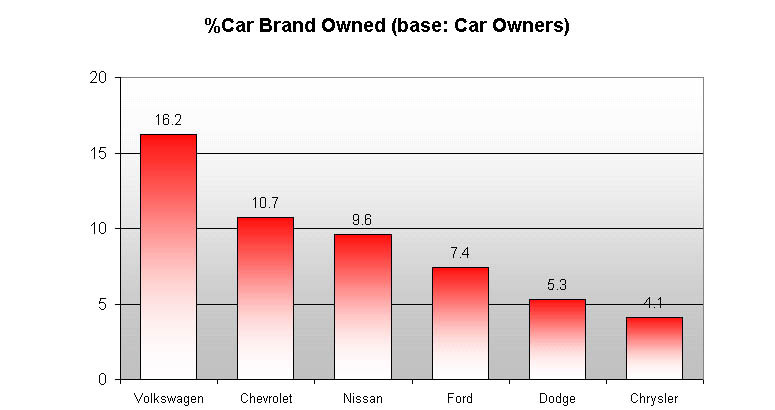 The top brands are shown in the following chart. Volkswagen, primarily through the large base of vochos but also including other makes such as the Jetta, is the industry leader. The vocho was a people's car and its enduring popularity in Mexico was based upon the fact that its operation was easy. Volkswagen spokeswoman Israel Victoria Diaz said, "Mexicans know the Beetle. They know how to fix it. They know they can find parts almost anywhere. And they know they can depend on it when driving on the country's rough road conditions." Most importantly, it was affordable. Construction worker Andrés Durán López said: "I really don't make enough money to own a car. My family owes a lot to this vocho. It still works after 11 years of hard punishment we've given it." 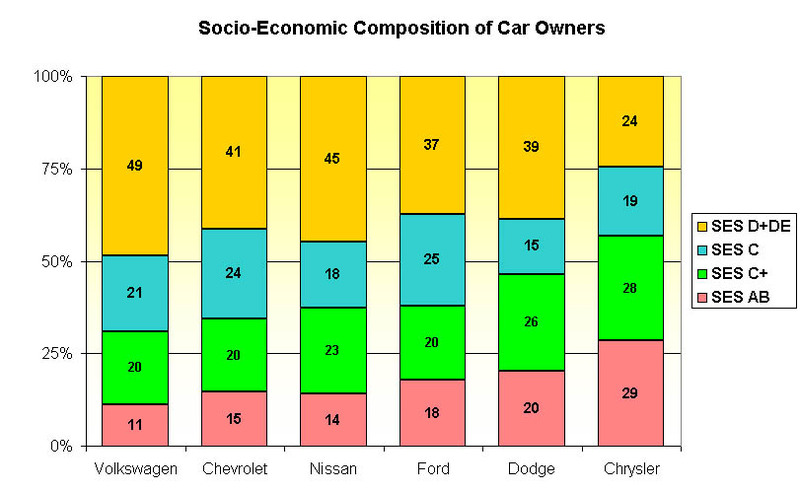 The vocho can be had in Mexico for only US$7,400 and this aspect is clearly shown in the socio-economic composition of car owners in the following chart. While it is not clear that who will take the place of the people's car in Mexico, those vochos will continue to be on the road for many more years.